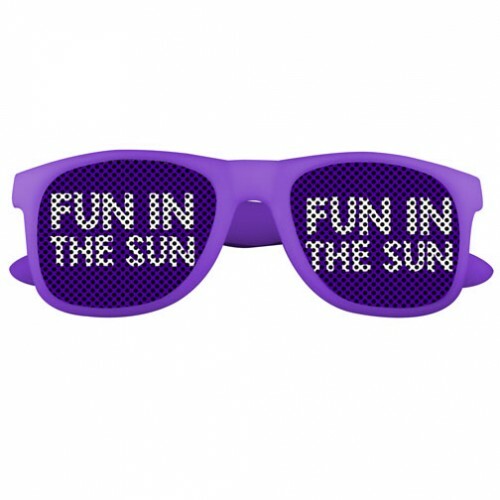 Surprise guests with a pair of our color changing custom logo lens sunglasses! These fun personalized sunglasses are frost colored when indoors then change to Blue, Pink, Purple or Yellow when exposed to sunlight. A great gift for any event, give them to your guests and let them discover the color changes when they go outside. Along with your full color logo imprinted on both lens, you have a walking billboard sure to be seen all over town once the party is over. The lenses contain small holes so that the wearer can see through the imprint. 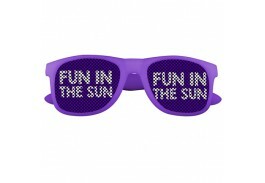 The UV400 tinted lenses provide UVA & UVB protection from the sun, making them a great giveaway for any outdoor event.